The Bank of Canada's Governing Council will be meeting on Wednesday to decide on a setting for the Bank of Canada's policy rate target, so now is as good a time as any to get you (and me) up to speed on Canadian monetary policy. We'll start with basics. In Canada, the Bank of Canada operates under the Bank of Canada Act, passed in 1935, and amended since then. Policy decisions are made 8 times per year, at pre-specified dates, roughly 2 to 3 weeks before each FOMC meeting in the US. 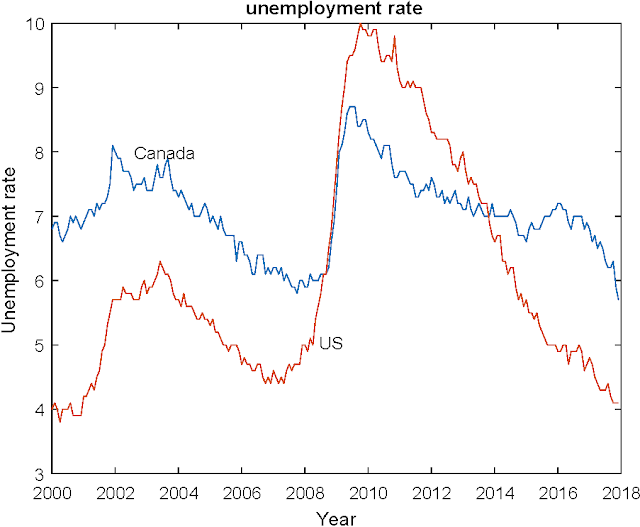 US monetary policy is important for what the Bank of Canada does, thus the synchronization of policy meetings, but presumably the Bank of Canada does not want to look like it is always following the Fed. The decision making body at the Bank of Canada is the Governing Council, which consists of the Governor, the Senior Deputy Governor, and four Deputy Governors. All of those people are appointed by the Bank's Board of Directors. The Board of Directors, in turn, consists of the Governor, the Senior Deputy Governor, and a group of people appointed by the cabinet of the federal government. The mandate of the Bank as specified in the Bank of Canada Act, is to "promote the economic and financial welfare of Canada." That's of course pretty vague, but since 1991 the Bank has had an explicit inflation target, worked out as an agreement with the Government of Canada. This agreement is reviewed and renewed every five years. Currently, the inflation target is specified as a 2% target for CPI headline inflation, with a range of 1-3%. 1. The public doesn't know what happens in a Governing Council meeting. There are no minutes or transcripts, and no reported vote. After the meeting, a statement is issued, and at every other meeting there is a press conference. 2. The top Bank of Canada officials are somewhat shy. They don't speak in public as much as, for example, Jim Bullard, the President of the St. Louis Fed. As well, Bank of Canada officials generally speak with one voice. Public dissent is not a thing. 3. To properly deal with the public in Canada, Bank of Canada officials have to be bilingual. So, when they stand up in public, they'll talk to you in both English and French. 4. The actual mechanics of monetary policy implementation are considerably different. There is an overnight market in which the Bank of Canada intervenes, but there is a small number of participants in this market. As well, the Bank operates in an environment in which overnight reserves are essentially zero. The Bank of Canada never went in for a large balance sheet and large-scale asset purchases after the financial crisis, in contrast to the US, the Euro area, Japan, the UK, etc. 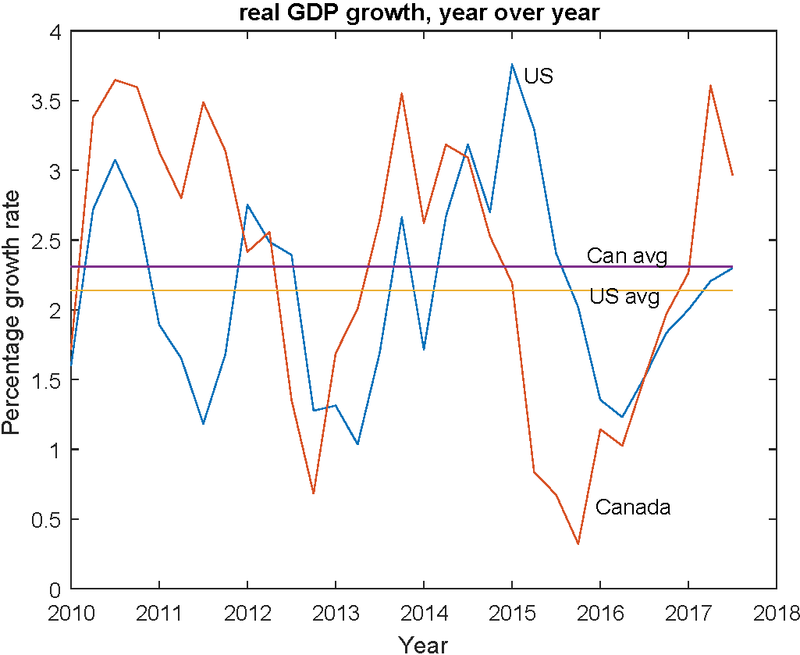 Growth rates are roughly synchronized in Canada and the US, over this period, but you can see somewhat more volatility in Canadian growth rates. As well, the average growth rate over this period is somewhat higher in Canada. Recently, growth has been quite strong in Canada, particularly in the second and third quarters of 2017 (in the 3-3.5% ballpark). 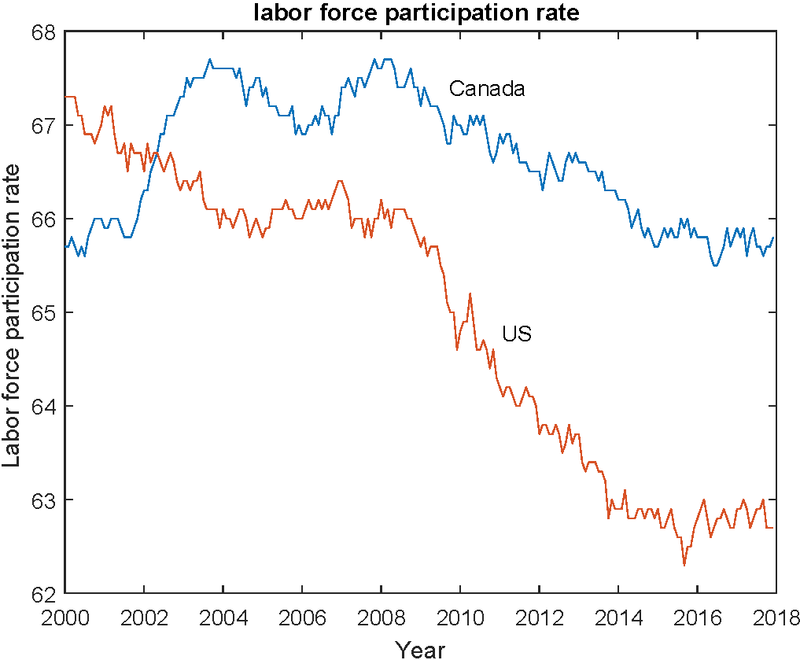 As you can see, labor force participation has dropped somewhat in Canada since 2008, but not to the same degree as in the United States. Indeed, the Canadian population has a similar age structure to the US population - for example the post-WWII baby boom phenomenon is similar in the two countries. 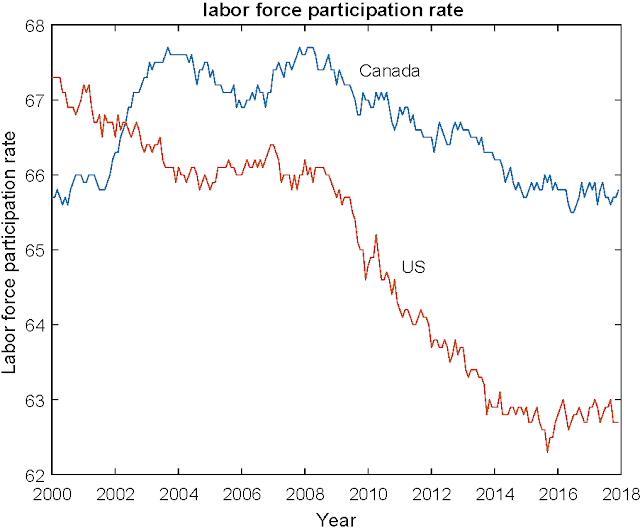 Yet, the Canadian participation rate is currently three percentage points higher than in the US. 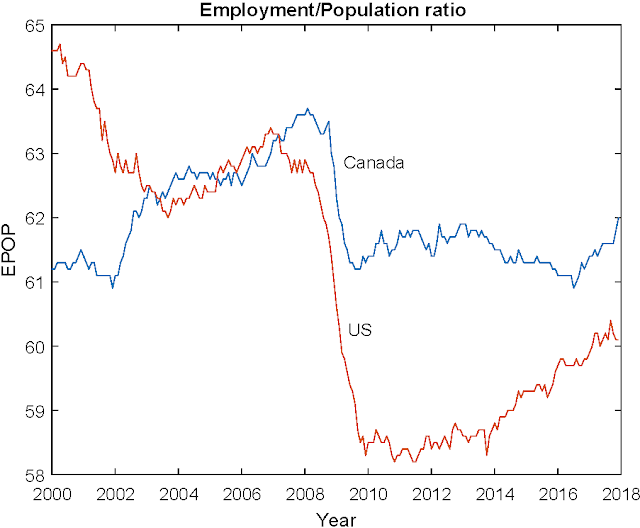 It's not clear what explains this or if, for example, one can explain all of the decline in the Canadian participation rate with demographic factors. 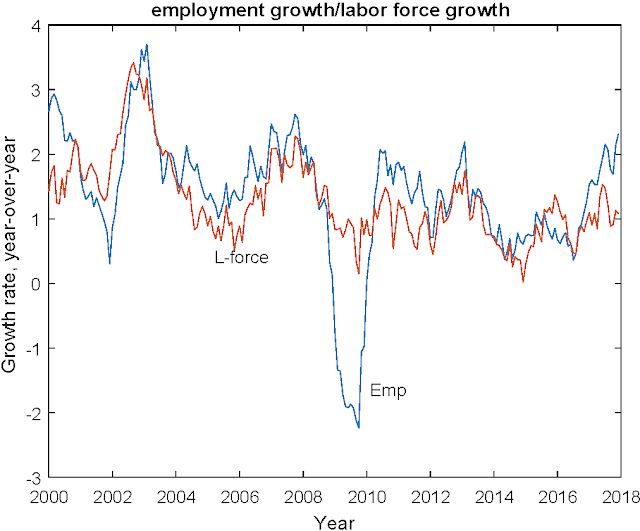 So, recent employment growth rates, year-over-year, have been in the vicinity of 2%, but with labor force growth hovering around 1%, that sort of rapid employment growth cannot be sustained. With respect to headline CPI inflation, the Bank of Canada has tended to miss on the low side for the last five years, though inflation is current right at target. 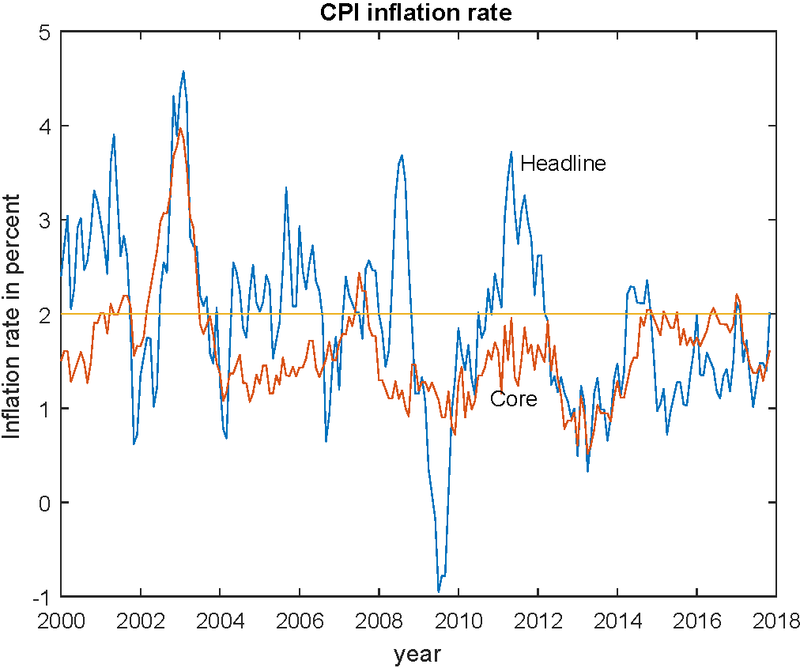 I've included a core measure inflation (excluding food and energy prices), but I'm not a big fan of stripping prices out of the index - better to have an idea how persistent the effects of particular shocks are on inflation. The Bank of Canada increased its policy target twice during 2017. The target for the overnight interest rate went from 0.5% to 0.75% in July and then to 1.00% in August. So what will the Bank do on Wednesday? 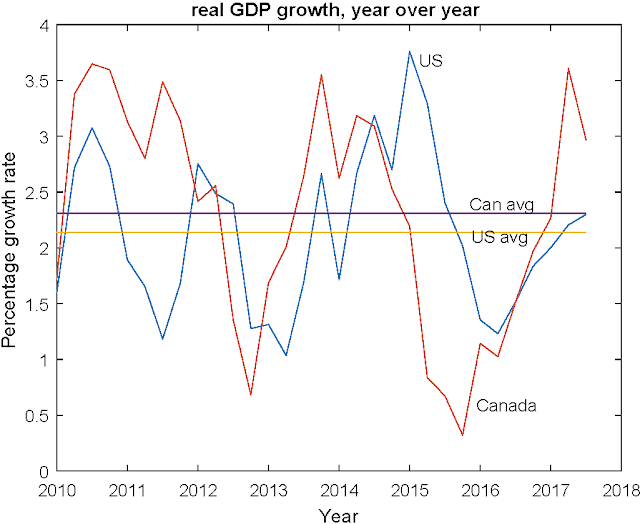 Given the data I showed you, it looks like the Canadian economy is performing well - somewhat better than the US economy, with relatively strong real GDP growth and employment growth, and a labor market that looks fairly tight. And the Bank is hitting its inflation target. So why should the Bank do anything? Inflation has been slightly higher than anticipated and will continue to be boosted in the short term by temporary factors, particularly gasoline prices. Measures of core inflation have edged up in recent months, reflecting the continued absorption of economic slack. Revisions to past quarterly national accounts have resulted in a higher level of GDP. However, this is unlikely to have significant implications for the output gap because the revisions also imply a higher level of potential output. Meanwhile, despite rising employment and participation rates, other indicators point to ongoing­ – albeit diminishing – slack in the labour market. Based on the outlook for inflation and the evolution of the risks and uncertainties identified in October’s MPR, Governing Council judges that the current stance of monetary policy remains appropriate. While higher interest rates will likely be required over time, Governing Council will continue to be cautious, guided by incoming data in assessing the economy’s sensitivity to interest rates, the evolution of economic capacity, and the dynamics of both wage growth and inflation. That's certainly Phillips curve language, so the Bank thinks that measures of excess capacity or slack tell us something about where inflation should be going. Here are some such measures that the Bank likes to look at, apparently. 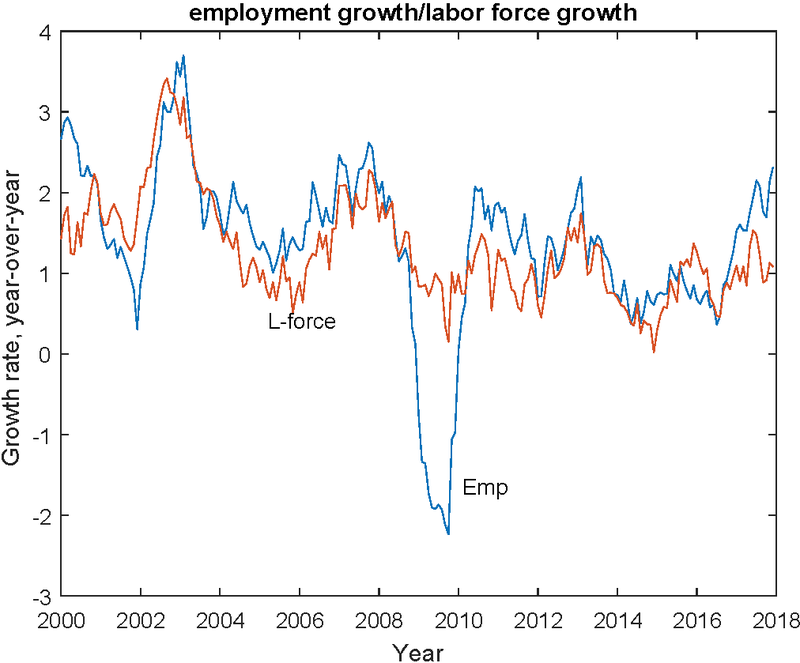 Like all Phillips curve believers, Bank officials have to be puzzled by their recent tendency to undershoot their inflation target in the face low unemployment. That's why they think there's still slack in the economy. Like the Fed, people at the Bank of Canada have gone on a slack hunt, looking for labor market variables that might justify a view that the economy is still underperforming. But, the statement above also says that "higher interest rates will be required over time." That is a form of forward guidance, but what's it telling us? The statement doesn't tell us why these higher interest rates might be required, or under what conditions increases might happen. But, to fill in the gaps, my best guess is that Steve Poloz thinks like Janet Yellen, who believes that interest rate hikes are justified so as to head off higher future inflation. That's a convenient fiction that allows interest rates to go up - otherwise true Phillips-curve-believer central bankers would just get stuck in a policy trap with low nominal interest rates and low inflation forever - everyone turns into Japan, basically. In this instance, a Neo-Fisherian approach might justify another increase. On average, inflation has been below the target somewhat, so another 25 basis points north won't hurt - it'll make inflation go up. The Governing Council, using a get-ahead-of-the-curve approach - basically Phillips curve wakes up and asserts itself - will likely go for the 25 basis point increase in the policy rate, which of course will be self-fulfilling. News since the last meeting has been good in terms of labor market performance for example - the unemployment rate dropped two points - and inflation has gone up. Best guess is that the policy rate goes up tomorrow. "The top Bank of Canada officials are somewhat shy. They don't speak in public as much as, for example, Jim Bullard, the President of the St. Louis Fed. As well, Bank of Canada officials generally speak with one voice. Public dissent is not a thing.."
If you were in charge of setting up a central bank bank, what would you choose? The BoC's one voice or the many-voiced Fed? Why is central banking so politicized in the U.S. while up here it's a non-issue? For instance, there's an End the Fed movement, but no End the Bank of Canada campaign. "If you were in charge of setting up a central bank bank, what would you choose? The BoC's one voice or the many-voiced Fed?" The dissent within the Fed system is healthy. In some central banks, promotion can depend on how well you treat your superiors - there isn't a big payoff to asking tough questions. In the Fed system the decentralization breeds competitive ideas, and alternative ways of looking at the world. The downside can be in public relations. Sometimes the public can get confused if the central bank speaks with many voices. That's what's behind the long blackout periods the Fed has. If people are restricted from speaking in public for a period of time around policy meetings, that might clarify the message. Of course it also means that there is less public discussion of what the central bank is doing, and fewer opportunities for the public and people in the media to ask questions. "Why is central banking so politicized in the U.S. while up here it's a non-issue?" In the US there was a lot of resistance to central banking from the beginning. In fact, there were two failed attempts at creating a central bank - the First and Second Banks of the United States. The Second was killed off by Andrew Jackson. The reason the Fed is structured as it is was due to suspicion in the US of centralized power, and of the government as well - the Fed is both decentralized and quasi-private. I'm not sure anyone had a problem with the Bank of Canada at the outset. I'm guessing that, in 1935, when everyone was very focused on ties to the UK, a proposal that we have an institution like the Bank of England wouldn't have kept anyone awake at night. The large commercial banks lend to the small ones in the overnight market and the interest rate on reserves effectively sets a floor under the overnight rate in Canada. In contrast, the financial frictions make all the difference in the US in a way that the Federal Home Loan Banks account for majority of lending and the branches of foreign banks account for majority of borrowing in the overnight market. These financial frictions (like federal deposit insurance fee) seem to emerge from the regulatory differences between commercial banks and shadow banks. 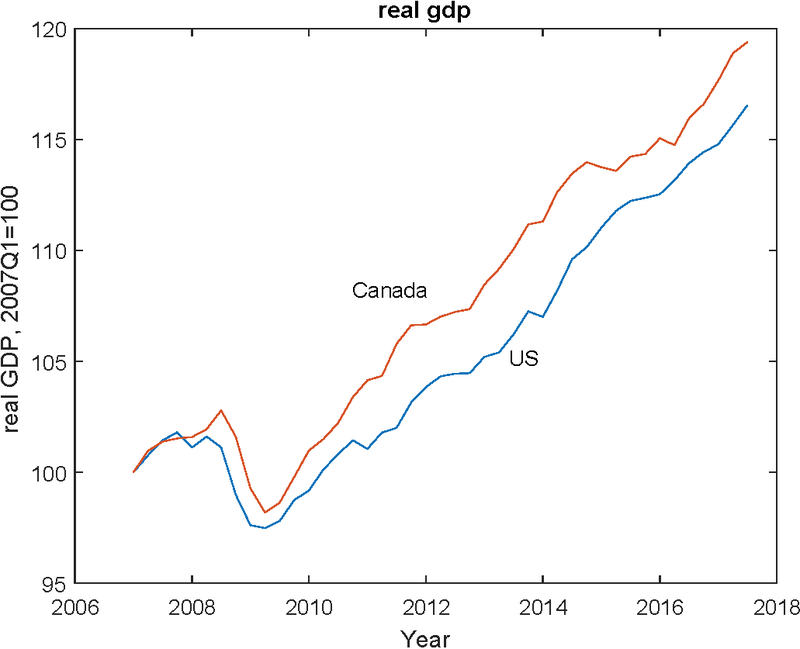 Then it is not unreasonable to say that unconventional banking sector has a smaller effect on monetary policy implementation in Canada than US. Why is that? If the solution is regulating larger array of economic institutions, why does not US follow it? LVTS has 16 participants - they can borrow from the Bank of Canada, and hold deposits (reserves) at the Bank. And they all get interest on reserves balances, so no issues of some institutions with reserve accounts not getting interest, as with the GSEs in the US. There is group of fringe financial institutions - credit unions and trust companies - which are small. But otherwise, the Canadian system is dominated by a few large chartered banks. You're right that what we would call shadow banking is a smaller issue in Canada. As well, there is not a counterpart of the money market mutual fund industry in Canada, which evolved in the US due to the nature of regulations on commmercial banks and other financial institutions.